THE GOVERNMENT HAS announced the establishment of an expert group to tackle the health risks posed by carcinogenic radon gas in homes around Ireland. The group will bring together all the relevant public bodies to come up with a united approach to the problem, environment minister Phil Hogan said at the National Radon Forum in Dublin yesterday. It is estimated that radon gas exposure contributes to 200 deaths from lung cancer in Ireland every year. Some 91,000 homes nationwide are thought to contain levels of the radioactive gas higher than the benchmark of 200 bequerels per cubic metre, due to buildups in the surrounding soil. A Radiological Protection Institute survey earlier this year found 800 houses where radon was significantly above safe limits. One house in Co Kerry was found to contain radon levels 185 times greater than the recommended safety limit – among the highest concentrations ever found in Europe. 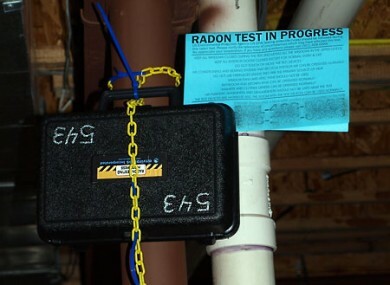 The new expert group has been given two years to come up with solutions to the radon problem. Radon is a naturally occurring radioactive gas which forms in the ground. It is colourless, odourless and tasteless but when inhaled its particles can attach themselves to lung tissue, increasing the risk of tumours. Email “Radon gas contamination to be tackled by expert group”. Feedback on “Radon gas contamination to be tackled by expert group”.